REITScreener was designed to make it easier for investors to quickly shortlist high quality REITs based on their historical track record. Hence, we designed a single metric that investors can simply use – the Quality Score! The Quality Score is a proprietary scoring system that comprises of 15 individual matrices which are weighted and summed up to a single aggregated value. REITs that score 75 or higher are considered to be the highest quality within their predominant real estate sector while a score above 60 to 74.9 are considered investment grade. The 15 matrices can be categorises into 2 distinct types – first is the growth and sustainability track record of the REIT and the second is the comparative matrices relative to its peers within the same real estate sector. 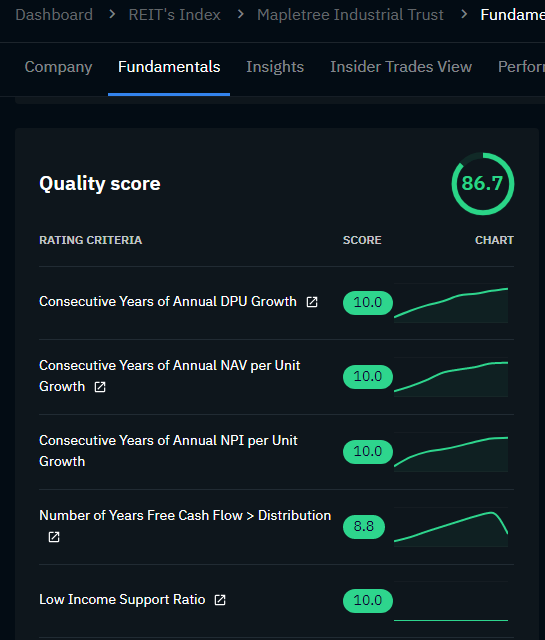 There are 2 main points that investors need to understand when using the Quality Score. First, due to the comparative nature of second group of metric, we advise that Quality Scores should be compare between REITs in the same real estate sector for greater reliable. Second, due to the use of year-on-year growth and sustainability comparisons, the score relies on historical performance to assess the track record of the REIT. Hence they become more reliable the longer the REITs has been listed. On the flip-side however, the Quality Score will be less reliable for newly REITs under 3 years. In summary, the Quality Score is most reliable when used to compare REITs within the same real estate sector and have been listed for more than 3 years. 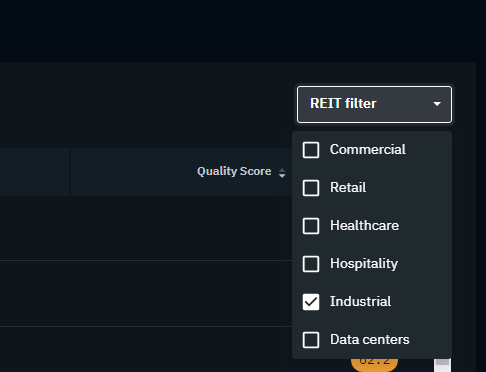 Let’s take the example of the Industrial REIT sector, using the filter on the top right, we can filter only the Industrial REITs. We can then sort the Quality Scores of all the REITs within the Industrial sector. With a quick glance, we are able to see that there are 3 shortlisted REITs which REITScreener has classified as Investable grade – Mapletree Industrial Trust the most is highly rated. this then allow investors to look deeper into these REITs. Using the breakdown of the 15 metrices that comprises the Quality Score, investors will be able to quickly identify which areas the REIT has performed well and which areas may pose a risk to Investors. 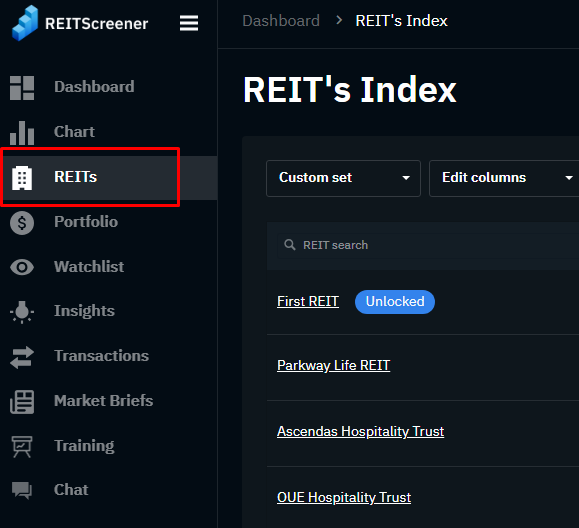 Combing through the rest information available on REITScreener, the news about the REIT and analysing the publications from the REIT, investors will be able to make a better informed decision on their investments. 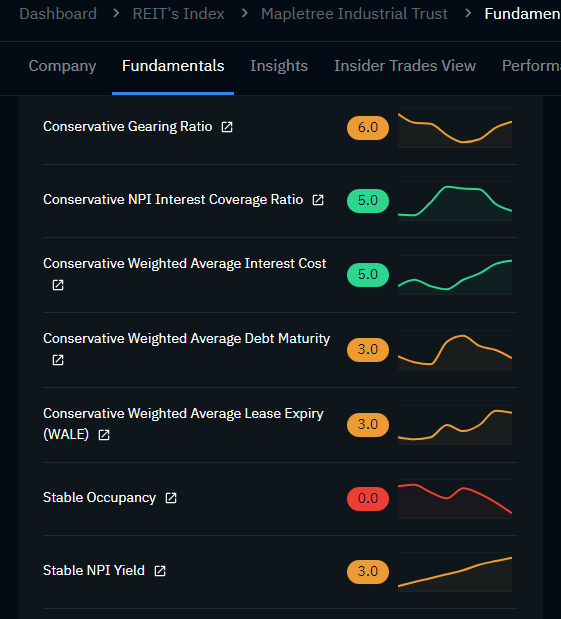 Looking at the Quality Scores and Top Gainers and Losers, you can see that 4 out of 5 of the top 5 performing REITs have Quality Scores above 60 and above while the bottom 5 performing REITs all have to have a Quality Scores below 60. Please note that the Quality Score is not a recommendation to buy or sell, instead it helps investors to shortlist REITs to analyse further and identify potential areas of risk in the REIT. A high Quality Score is an potential indication that that is the right REIT. But knowing the right REIT to invest is not enough, we must also know the right price to invest in the REIT. For that, check out our next article on the Valuation Metrics.